Today, Ben Knapen, the Dutch State Secretary for development cooperation, presented the “Resultatenrapportage”, the “reporting of results” on Dutch efforts in development aid in the period 2009-2010 . He used the occassion to also present the first release of Dutch government data in the IATI standard format, making The Netherlands the fifth signatory to deliver on its commitment for phase 1 of the IATI agreement. The “Resultatenrapportage” report itself is the result of the collaboration of some two hundred writers from government and NGOs, in a process led by the Ministry of Foreign Affairs and Partos, the Dutch platform of organisations in development cooperation. To make the report a stepping stone towards sharing more data online, it is no longer being printed, but instead made available as PDF document, with links to offer easy access to background documents and data. 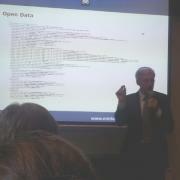 At the same time, the State Secretary announced the opening of http://www.minbuza.nl/opendata with the first set of spending data released, up to date to the end of the second quarter of 2011. Behind the scenes, the last bits are put in place to automatically register the data at the IATI registry. The data will be udpated quarterly, so the next release is expected to already happen in early October. It will be interesting to see how the regular publication of the data leads to continuous improvement of the data: less jargon, less abbreviations, clearer descriptions. In addition to the IATI data, there also is a set of documents of embessies, reporting on the progress of particular projects in countries around the world. An open challenge is to now find ways to link the information in these documents to the data available in IATI. Knapen expects civil society to also publish their data in IATI, so that it becomes easier to look directly into the operations and processes happening at the core of international development cooperation. The Guardian has made a website to slice and dice the data of the World Bank, DFID, etc. In collaboration with Akvo, the Ministry is doing a pilot project to show their water project portfolio, but Knapen hopes that parties in The Netherlands will also explore the expanding universe of data to answer their own questions and develop their own perspective on what is happening. After offering the report on a (symbolic) USB stick to Nebahat Albayrak of the Parliamentary committee for foreign affairs, she said she hopes the open data will make the political debates more informed and perhaps even a bit more objective, but also stressed the importance of reflecting on actual impacts as done in the “Resultatenrapportage”. Albayrak also hopes to also evaluate the “resultatenrapportage” and the “open data” initiatives and standards from the perspective of effectiveness for their work in the “kamercommissie”. Posted in Aid Transparency, News, Open for Change, Syndicated and tagged Ben Knapen, IATI, Ministry of Foreign Affairs, Netherlands, Open Data, State Secretary for development cooperation.